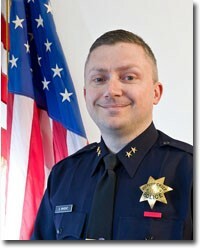 Some news media have portrayed the rapid change in leadership at the Oakland Police Department this week as evidence that the city is in “crisis.” And while it’s clear that OPD has been in crisis for a long time, the selection of Deputy Chief Sean Whent to take over as interim police chief today, replacing Acting Chief Anthony Toribio just two days after he took over for retiring Chief Howard Jordan, is a smart choice. In fact, the mistake that Mayor Jean Quan and City Administrator Deanna Santana made was that they should have appointed Whent to the top job on Wednesday. Over the past several years, Whent has repeatedly proven himself to be one of the few commanders in OPD to be openly critical of the department’s failure to deal with problem police officers and with OPD’s ineffective Internal Affairs Division. Several years ago, he was highly critical of then-Sergeant Derwin Longmire for his botched investigation into the murder of Oakland journalist Chauncey Bailey. Whent believed that Longmire purposely screwed up aspects of the case because of Longmire’s longtime relationship with Yusuf Bey IV, the man who ordered Bailey’s assassination. In an interview today, Quan said that Compliance Director Thomas Frazier signed off on Whent’s appointment, which is not surprising. Frazier also has been openly critical of the failure by OPD to properly investigate internal affairs cases and hold problem cops accountable. Moreover, in a sworn deposition last year stemming from OPD’s federal consent decree, Frazier singled out Whent for his candor about OPD and the culture within the Internal Affairs Division (IAD) of protecting its own. Whent also has been critical of OPD’s criminal investigations division, which has one of the worst records in the nation for solving crime. OPD consultant William Bratton, the former police chief of New York and Los Angeles, echoed that criticism this week in a new report on the department. In his deposition, Frazier also singled out Danielle Outlaw, whom Whent named today to be acting deputy chief in charge of internal affairs, for being candid about OPD’s shortcomings. In fact, Chanin expressed hope that Whent and Outlaw can finally lead the department into compliance with court-mandated reforms after ten years of failure. “Now we’re going to find out if there’s any hope at all,” he said. Reporter Ali Winston contributed to this report.